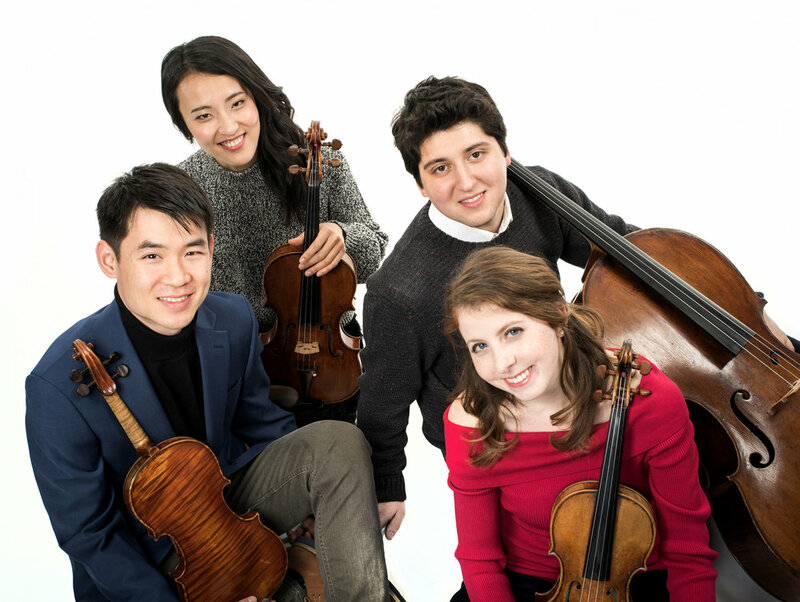 Distinctive among today’s young string quartets, the Omer Quartet won First Prize in the 2017 Young Concert Artists International Auditions, and it makes debuts during the 2018-2019 season in New York at Merkin Concert Hall and in Washington, D.C. at the Kennedy Center. The quartet came into prominence in 2013 when it received Grand Prize and gold medal at the Fischoff National Competition. It has also received Top Prize at the 2017 Premio Paolo Borciani Competition in Italy, Second Prize at the 2017 Trondheim International Competition in Norway, and Special Prize at the 2016 Bordeaux Competition in France. Omer Quartet's NYC Debut reviewed in the New York Times! The Omer Quartet will perform at the Merkin Concert Hall, New York, on December 11, 2018. The Omer Quartet, winners of the Young Concert Artists and Borciani Competition, will be in concert at the Merkin Concert Hall, New York, on December 11, 2018. The Quartet comprises of Mason Yu and Erica Tursi, violins; Jinsun Hong, viola and Alex Cox, cello. They are the recipients of the Helen F. Whitaker Chamber Music Chair. The Ernst Stiefel String Quartet-in-Residence performs at Caramoor throughout their residency, enabling the public to experience these exciting young players in an intimate setting. The Omer Quartet is the 19th Ernst Stiefel String Quartet-in-Residence at Caramoor. They will be visiting schools as music mentors in the fall and spring, and performing concerts at Caramoor in the fall, spring, and summer. Perlman Music Program/Suncoast opens its 2017-18 season with multiple performances by the Omer Quartet, featuring PMP alumni playing works by Mozart, Beethoven, Bartok and more. It starts Friday with a performance surrounded by Ringling College of Art & Design’s “Real + Ready” exhibition. On Sunday they will perform at The Harvest Sarasota, then Tuesday at Manatee Technical College’s auditorium. Omer Quartet wins 1st prize at 2017 Young Concert Artists International Auditions, in New York City. Omer Quartet‘s 2nd prize winning performance in the Final of the 2017 9th Trondheim International Chamber Music Competition, in Trondheim, Norway.